Worm snakes are a genus of nonvenomous snakes that live primarily in soil and leaves. They are proficient diggers and eat earthworms and insects. Georgia is home to one species of worm snake, the Eastern worm snake. 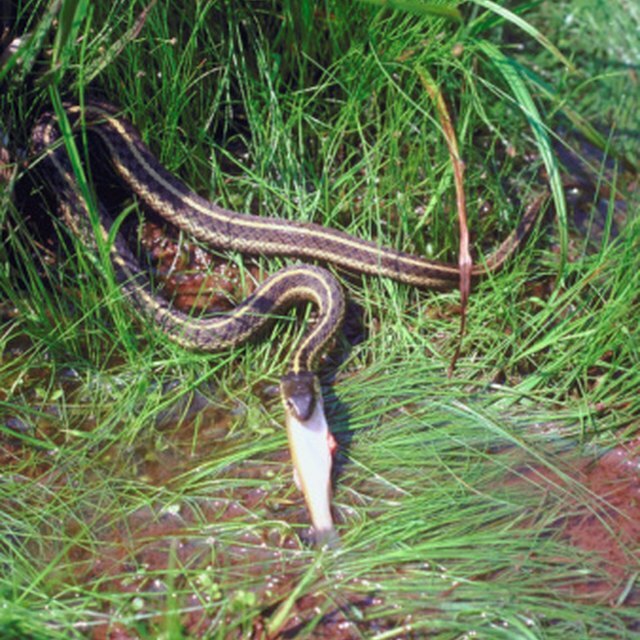 Though many people panic upon first seeing one of these snakes, they play a vital role in Georgia's ecosystem, and are mostly harmless to humans. The Eastern worm snake is named for its worm-like appearance. It is only one to two inches in diameter and 10 to 13 inches long. The Savannah River Ecology Laboratory reports that Georgia's worm snake has a brown body with a white or pink belly. The belly's color may partially extend to the sides of the snake, creating an appearance of light-colored stripes on either side of the snake. Babies are similar in color to adults but with smaller bodies. The Eastern worm snake is neither venomous nor aggressive. However, it does have a slightly pointed tail tip that it presses against attackers. Some species of worm snake use this tail tip like a stinger, though the Eastern worm snake is incapable of inflicting harm with the tip of its tail. Females lay about a dozen eggs in the spring or summer. Worm snakes eat a variety of insects, snails and earthworms. They are also prey to several larger animals. Worm snakes live in most areas east of the Mississippi River. They avoid very cold climates like northern New England and very warm climates like southern Florida. They spend most of their lives underground and are most frequently encountered by humans during gardening projects. They prefer moist environments and are most common in forests near wetlands and swamps. These snakes are neither endangered nor threatened. Davis, Brenna. "Worm Snakes in Georgia." Sciencing, https://sciencing.com/worm-snakes-georgia-8591755.html. 24 April 2017.